Review: Tom Dicicco is best known for his stern techno output, so it's intriguing to seem him donning a new alias, Veyg, and exploring a new sound palette. As with the last Veyg 12", the tone here is somewhere around the slower tempo, discoid acid end of the spectrum, and he's made the sound his own. "My Sweet Soul" is a dusty affair with squashed drums and looped up bongos rubbing up against trippy globules of lysergic monosynth action. "When They Fall" is a downcast electro track for rainy Sundays, while "These Feelings" waits for the clouds to break and dances on the damp lawn with no shoes on. "West Of The Sun" is the most adventurous offering on the 12", escaping the 4/4 thud and twirling in an off-grid stylee with ample dub FX tugging the melodic parts around in a mellifluous haze of experimentation. 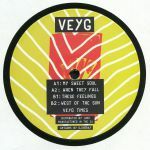 Review: Newcomer Tom Dicicco aka Veyg presents an ear snagging selection of leftfield beatdowns here for adventurous spinners on the fringes of the party. "Mutual Romance" is a quivering, shimmering trip through crooked house beats and crunchy yet dubby synth flourishes to delight the mind. 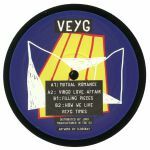 "Virgo Love Affair" has a sweeter lilt, but it's no less wayward in its execution, but then "Filling Pieces" heads into more explicit deep house territory with some blissed out melodic content riding atop a deep diving US-flavoured rhythm section. "How We Live" ramps up the meandering dub processing, with tripped out filter sweeps and panning lending a psychedelic edge to this smoked out joint.